New additions for 2016 to the Three Kings Gifts - 10 Inch Real Life Nativity Set. 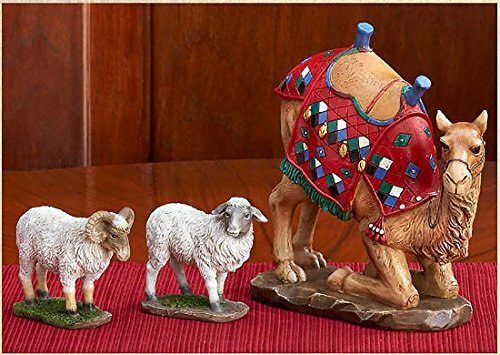 This three piece animal set includes a kneeling camel and two sheep. The sheep are modeled after the breed of sheep found in Bethlehem --- called Awassi sheep. They are notable for their shaggy coat, dark face, ruggedness and tolerance to extreme conditions. The set includes one ewe (female) and one ram (male) along with a brightly dressed camel kneeling in a reverent pose. The camel measures 7 inches tall by 5 3/4 inches long. The ewe measures 3 1/2 tall by 3 1/8 inches long and the ram measures 4 inches tall by 3 inches long. If you have any questions about this product by Three Kings Gifts, contact us by completing and submitting the form below. If you are looking for a specif part number, please include it with your message.